All guys are familiar with AXE daily fragrances – We set out to introduce a “Dual-Usage” message and change their daily grooming regime. Convincing them to use and buy both AXE fragrance and AXE anti-perspirant together. Using both fragrance and anti-perspirant provides bullet-proof confidence to get THE girl. Clever copywriting allowed us to communicate a dual message within a single headline. One headline meant two things. TOGETHER, Magic happens. Revealing: TO GET HER. Our message made clever use of an unknown Twitter hack to promote dual usage and the location of our in-store activation where guys could come play to redeem a free AXE product. 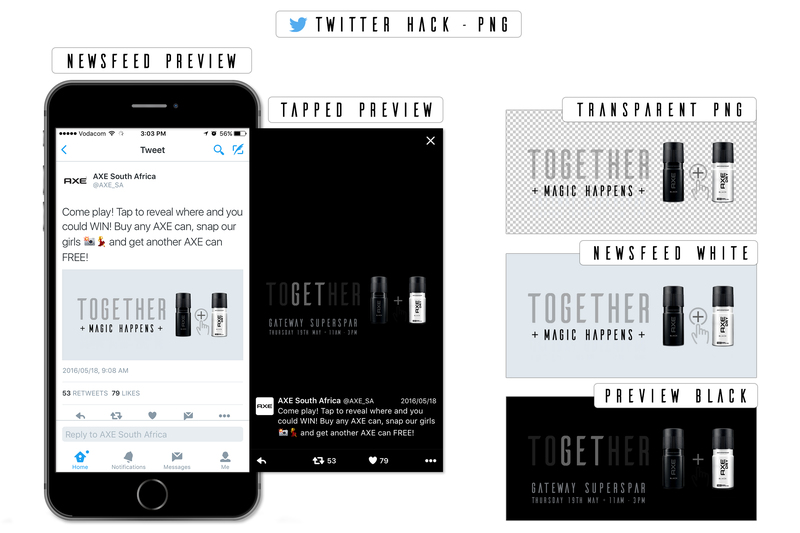 We posted a semi-transparent image (PNG) appearing white within Twitter’s newsfeed to display our first message ‘TOGETHER, Magic happens‘. The same image, when clicked on, appears black and reveals the hidden message ‘TO GET HER‘ and the store location “she” is at. 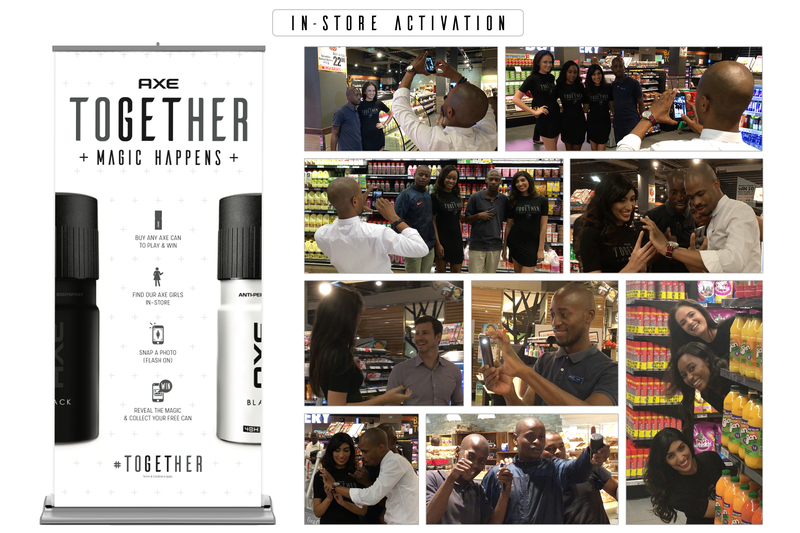 Inviting guys on Twitter, we created a fun in-store experience to physically promote dual usage and AXE’s magic effect. 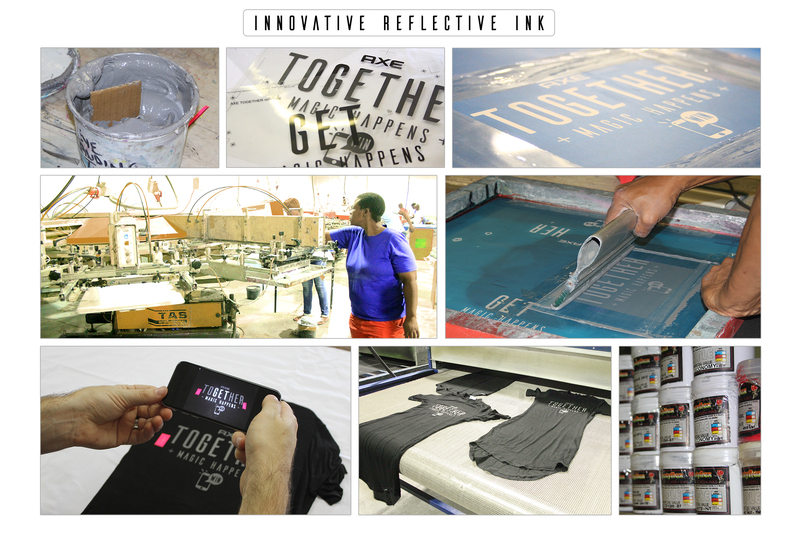 Utilising new technology in textile printing together with reflective ink, we re-invented the coupon mechanic by integrating our hidden message onto the dress of one of the many AXE girls in store. Testing their confidence, guys literally had ‘to get her’ by taking photos with their phone camera flash on, revealing whether or not the girl they found was “the one” to claim their free product. This simple mechanic made the campaign accessible to anyone with a cellphone camera. Guys posted selfies with our girls on social media, taking the in-store promotion online and spreading our dual-usage message. With many AXE fans sharing, commenting, retweeting and liking our post on Twitter we proved that a great piece of communication and consumer experience really does grow brand love. Despite limited visibility due to highly targeted location-based media placement leading to the in-store activation, it’s proving to be one of our best performing content pieces to date.